Edwin Smith Papyrus, or Edwin Smith Surgical Papyrus, is a preserved medical document from ancient Egypt that traces to about the sixteenth to seventeenth century B.C.E. but actually is the only surviving copy of part of a much older treatise on trauma surgery from about 3000 to 2500 B.C.E. The Edwin Smith Papyrus is one of the oldest surviving texts of medical literature (medical papyri) and is the world's oldest known surgical document. The Kahun Gynecological Papyrus is older (dating to about 1800 B.C.E.) while the Ebers Papyrus (dated to about 1550 B.C.E.) is longer and more complete. The Edwin Smith Papyrus contains 48 case histories beginning with discussion of injuries of the head and proceeding downward to the thorax and spine, but leaves off the beginning and end of the original surgical textbook. 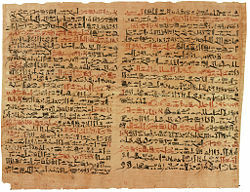 The Edwin Smith Papyrus changed the understanding of the history of medicine, demonstrating that Egyptian medical care of battlefield injuries was based on observable anatomy and experience in stark contrast with the often magical modes of healing described in other Egyptian medical sources, such as the Ebers Papyrus. The study of this medical treatise helps in understanding the state of health in ancient Egypt, the concept of disease, and the level of expertise. The Edwin Smith Papyrus provided evidence of a great deal of medical knowledge of the original author, such as references on how to set a broken jaw and how changes in body function can be traced to injuries of the brain or cervical spine, including how an injury on one part of the brain could be associated with paralysis on the opposite side of the body. The Edwin Smith Papyrus includes the first descriptions of such anatomical features as the meninges, the cerebrospinal fluid, and the external surface of the brain, as well as such medical treatments as surgical stitches and dressings. The Edwin Smith Papyrus comprises 17 pages (377 lines) on the recto and five pages (92 lines) on the verso (Demand 2000). (Recto refers to the right-hand page and verso to the left-hand page.) the rector and verso are written in the style of Middle Egyptian dating and with the same hand (Demand 2000). The Edwin Smith Papyrus is written around 1600 B.C.E. (NYAM 2005) in the hieratic script of the ancient Egyptian language, which is somewhat like a cursive form of hieroglyphics (Carpenter et al. 1998). The Edwin Smith Papryrus is a partial copy of an earlier document, dated to about 3000 to 2500 B.C.E. (Wilkins 1964). This original manuscript is considered to be a composite manuscript that contained, in addition to the original author's text, a commentary that was added a few hundred years later in the form of 69 explanatory notes (Breasted 1930; Wilkins 1964). The individual who copied the original manuscript, to yield the Edwin Smith Papryus, made many errors and corrected some of these in the margins (Wilkins 1964). The Edwin Smith Papyrus lacks the beginning and end of the original textbook and does not include the name of the author (Wilkins 1964). The copy stops at the bottom of a column, in the middle of a word, in the middle of a sentence, in the middle of a line, and leaves 15.5 inches (39 centimeters) empty at the end of the roll (Wilkins 1964). Imhotep, credited with being the founder of Egyptian medicine, was also thought to be the original author of the text (Peltier 1990), but internal evidence suggests it was written and edited by at least three different authors. The Edwin Smith Papyrus contains 48 case histories (typical, rather than individual), including presentation of the title, examination, diagnosis, treatment, and prognosis. The text begins by addressing injuries to the head, and continues with treatments for injuries to neck, arms, and torso, where the text breaks off. Included are description of 27 head injuries and 6 spinal traumas (Wilkins 1964). Each case is given a verdict of either favorable, uncertain, or unfavorable ("an ailment not to be treated"), with the later verdict, listed 14 times, not found in any other Egyptian medical treatise (Wilkins 1964). The surgical procedures in the papyrus were quite rational given the time period (Rutkow 1988), and the use of magic for treatment is resorted to in only one case (Case 9). There is differentiation between rational surgical treatments and medico-magical treatments (Wilkins 1964). There is, however, a description of magical incantations against pestilence (NYAM 2005). Among the treatments are closing wounds with sutures (for wounds of the lip, throat, and shoulder), preventing and curing infection with honey and moldy bread (penicillin? ), and stopping bleeding with raw meat. Immobilization was often advised for head and spinal cord injuries, which is still in practice today in the short-term treatment of some injuries. The papyrus also describes anatomical observations in exquisite detail. It contains the first known descriptions of the cranial sutures, the meninges, the external surface of the brain, the cerebrospinal fluid, and the intracranial pulsations (Wilkins 1964). The papyrus shows that the heart, vessels, liver, spleen, kidneys, ureters, and bladder were recognized, and that the blood vessels were known to be connected to the heart. Other vessels are described, some carrying air, some mucus, while two to the right ear are said to carry the breath of life, and two to the left ear the breath of death. The physiological functions of organs and vessels appeared to be a complete mystery to the ancient Egyptians (Hakim and Papalois 2007). Like the Ebers Papyrus, the Edwin Smith Papyrus was purchased by Edwin Smith in 1862. Edwin Smith was an American living in Cairo, Egypt, and he has been described as a dealer of antiquities, an adventurer, and a money lender (Demand 2000). Smith bought the ancient manuscript from a dealer named Mustapha Aga in the city of Luxor, Egypt. First he bought an ancient manuscript where the roll was missing some of its outer portions and two months later was sold the remaining fragments glued onto a dummy roll (Wilkins 1964). Smith placed the two parts together and recognized the importance of the manuscript. He also attempted to translate it, but never published it. He died in 1906, leaving the papyrus to his daughter who gave it to the New-York Historical Society (Rutkow 1988). In 1920, the Society asked James Breasted, director of the Oriental Institute at the University of Chicago, to translate it, a task he completed by 1930 (Rutkow 1988). In 1938, the Smith Papyrus was sent to the Brooklyn Museum, and in 1948 it was transferred to the New York Academy of Medicine where it remains (David 2000). The Papyrus was exhibited for the first time since 1948 at the Metropolitan Museum of Art from September 13, 2005 to January 15, 2006. Coinciding with the exhibition James P. Allen, curator at Met, prepared a completely new translation of the papyrus, which is included in the catalog for the exhibition. Breasted, J. H. 1930. The Edwin Smith Surgical Papyrus. The University of Chicago. Oriental Institute publications, vol. III-IV. Chicago, Ill: The University of Chicago Press. David, A. R. 2000. The Experience of Ancient Egypt. London: Routledge. ISBN 0415032636. Dawson, W. R., and E. P. Uphill. 1995. Who Was Who in Egyptology. London: Egyptian Exploration Society. ISBN 0856981257. Demand, N. H. 2000. Medicine in Ancient Egypt; Medical Papyri. The Edwin Smith Papyrus. Asclepion. Retrieved November 18, 2008. Hakim, N. S., and V. E. Papalois. 2007. Surgical Complications: Diagnosis & Treatment. London: Imperial College Press. ISBN 9781860946929. New York Academy of Medicine (NYAM). 2005. Academy papyrus to be exhibited at the Metropolitan Museum of Art. New York Academy of Medicine. Retrieved November 18, 2008. Nunn, J. F. 1996. Ancient Egyptian Medicine. Norman, OK: University of Oklahoma Press. ISBN 0806128313. Peltier, L. F. 1990. Fractures: A History and Iconography of Their Treatment. Norman orthopetic series, no. 1. San Francisco: Norman Pub. ISBN 0930405161. Rutkow, I. M. 1988. The History of Surgery in the United States, 1775-1900. Norman bibliography series, no. 2. San Francisco: Norman Pub. ISBN 0930405021. Wilkins, R. H. 1965. Neurosurgical Classics. New York: Johnson Reprint Corp.
Wilkins, R. H. 1964. Neurosurgical Classic-XVII: Edwin Smith Surgical Papyrus. Cyber Museum of Neurosurgery. Reprinted from the Journal of Neurosurgery, March 1964, pages 240-244. Retrieved November 18, 2008. Cybermuseum of Neurosurgery: translation of 13 cases pertaining to injuries of the skull and spinal cord, with commentary. History of "Edwin Smith Papyrus"
This page was last modified on 20 September 2017, at 20:01.